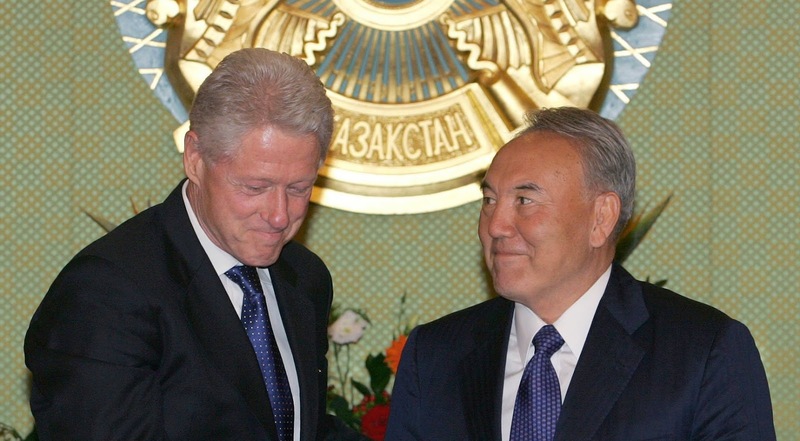 On Sep. 6, 2005, Bill Clinton met with Kazakh strongman Nursultan A. Nazarbayev. Two days later, Bill’s friend, Frank Giustra, received coveted Kazakh uranium mining rights—even though Giustra had no uranium mining track record. The industry was stunned. 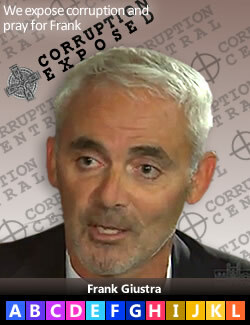 Within months, The Clinton Foundation received $152 million in “donations” from Frank Giustra. Two years later, Giustra sold those rights for $3.1 billion. Hillary and Bill did not disclose their Foundation winnings until forced to recently by Canadian authorities. Goldman Sachs assisted Giustra, and everyone else swirling around the Clinton's New World Order community organizing. (Jan. 29, 2016)—On Sep. 06, 2005, Bill Clinton jetted to Kazakhstan with Canadian Frank Giustra in a hastily arranged meeting with President Nursultan A. Nazarbayev. Giustra had just incorporated a shell (new, not operating) company named UrAsia Energy Ltd. with the help of Goldman Sachs. Fig. 3—Frank Giustra, UrAsia Energy Ltd. In the previous nine months, Clinton had been paid $925,000 in fees for six speeches to Goldman Sachs and Deutsche Bank. [The issue is not the amount of the fees, however dubious, but rather the audience. We believe that Bill and Hillary's speaking engagements have merely been the smokescreen for their New World Order global community organizing. While Bill was busy with Goldman Sachs and the uranium deal, Accel Partners invested $13 million in Facebook on May 26, 2005. A week later, Yuri Milner started Digital Sky in Moscow with Goldman Sachs as an investor. Accel Partners and Milner are Facebook’s second and third largest shareholders today. Goldman Sachs is one of Facebook's underwriters who sponsored Facebook's initial public offering (IPO). Fig. 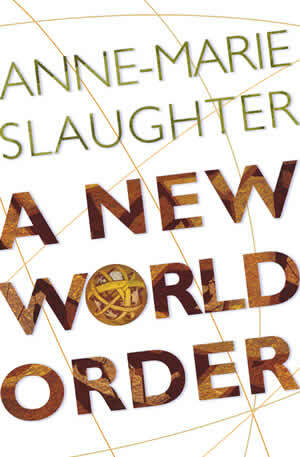 4—A New World Order by Anne-Marie Slaughter. Princeton University Press (2004). On Sep. 07, 2005, a day later, Kazakhstan agreed to give UrAsia coveted uranium mining rights, even though Giustra had no uranium mining experience, and UrAsia was only a shell company. The mining industry was stunned. 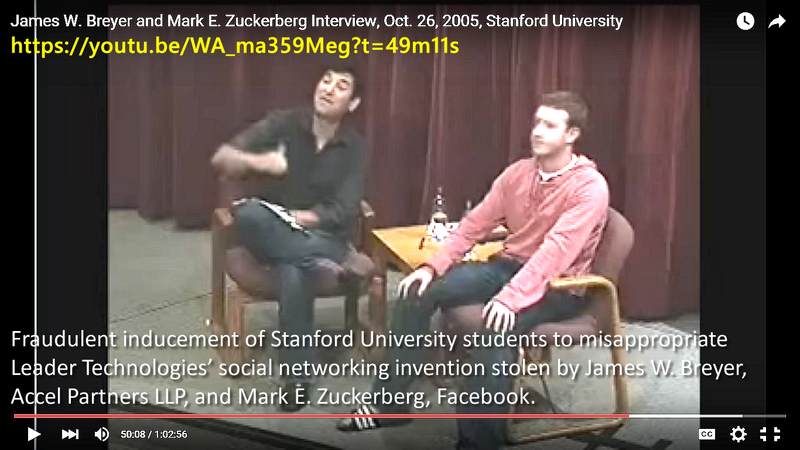 VIDEO: On Oct. 26, 2005, nine weeks later, Accel Partners’ James W. Breyer and Mark Zuckerberg spoke to Stanford University students about Facebook. During the presentation, they solicited the students to write apps to run on Facebook. That solicitation was captured on video. Is the questioner a ringer? Watch Breyer's and Zuckerberg's body language. Fig. 5—On Oct. 26, 2005, James W. Breyer and Mark E. Zuckerberg likely committed a crime. We believe they fraudulently solicited Stanford University students to help them write applications to run on Facebook. Facebook's software engine is the invention of Columbus, Ohio innovators Leader Technologies and their founder, Michael T. McKibben. Breyer and Zuckerberg were thus engaged in fraudulent inducement to misappropriate property that did not belong to them. The fact that they crossed state lines to commit this crime would amount to racketeering under the RICO Act, among other offenses. In our opinion. Click here to go directly to 49 minutes and 11 seconds into this one hour video capture at Stanford University. Click here for the raw video file (*.mp4). Since Facebook was proven in federal court to have been using Leader Technologies’ social networking invention, Breyer’s and Zuckerberg’s Oct. 26, 2005 solicitation would be fraudulent inducement, and this Stanford video is hard evidence of The Greatest Financial Crime in the History of the World. Hillary Clinton’s stonewalled emails revealed her promotion of Facebook “E-diplomacy” from the start of her tenure as Secretary of State in early 2009. At that time, the Leader v. Facebook patent infringement trial was only months old. Hillary’s policy grossly interfered with Leader Technologies’ due process rights. In the only part of the Leader v. Facebook trial that Hillary’s lawyer cronies could not control, the jury, Leader Technologies proved on 11 of 11 counts that Facebook infringes Leader’s U.S. Patent No. 7,139,761 for social networking. The RICO Act, 18 U.S.C. § 1962 (Racketeer Influenced and Corrupt Organizations Act) requires proof of a "pattern of racketeering" activity. A pattern defined as two or more activities where the person directly or indirectly invests in, maintains an interest in, participates in, conducts the affairs of, or acquires income used to acquire an interest in an enterprise, among other things. “[A] democracy is effective only if the people have faith in those who govern, and that faith is bound to be shattered when high officials and their appointees engage in activities which arouse suspicions of malfeasance and corruption.” (United States v. Miss. Valley Generating Co., 364 U.S. 520, 562 ). Here is the sequence of Bill Clinton events in this uranium deal corruption. Also evident is the support Goldman Sachs gave at every turn. Feb. 10, 2007 U.S. candidacy Barack Obama X Springfield IL Secretary of State $431 billion Wall Street "bailout"
Table 1—A pattern of corruption involving Bill Clinton, Goldman Sachs, Frank Giustra, James W. Breyer, Mark E. Zuckerberg and Facebook. See previous post AFI (Aug. 12, 2015). Hillary & Bill shill for a secret intelligence agency cartel. Americans For Innovation. The evidence shows that the developments in Facebook were a direct function of Bill Clinton's collaboration with Goldman Sachs. Bill met with Goldman Sachs, then Accel Partners invested in Facebook. Bill started getting $152 million from Giustra, then Breyer and Zuckerberg induced Stanford students to write apps, after which Breyer secretly started WIN-IN-CHINA in Hong Kong, outside the knowledge of U.S. regulators (revealed by HSBC whistleblower Hervé Falciani). 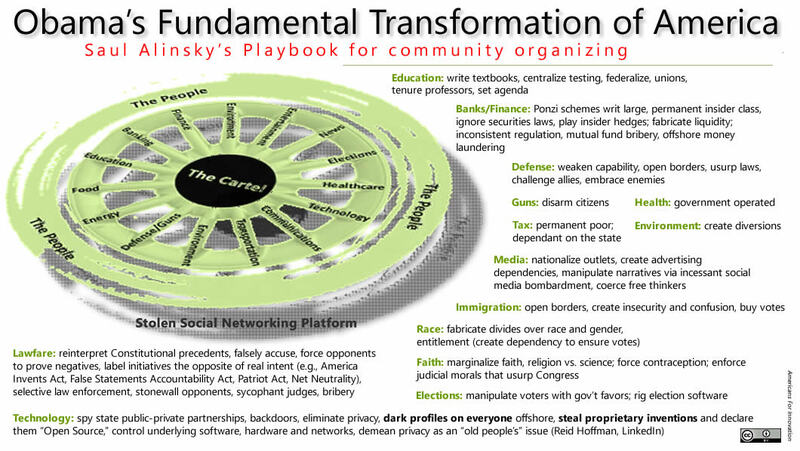 Facebook was established with Bill's and Goldman Sachs' money, then Barack Obama announced his candidacy on the platform, eventually claiming that his presidency would "fundamentally transform America." Hillary became Secretary of State intent on making Facebook a cornerstone of her E-diplomacy, irrespective of whether or not Facebook was violating patent law. Bill Clinton evidently used his influence as America's former president to cajole President Nazarbayev to give the uranium mining contracts to UrAsia within a day, even though Frank Giustra had no experience in uranium mining (but Goldman Sachs had friends who did). At every turn, Goldman Sachs and Bill Clinton are major players in the process. Click here for a full timeline of this public corruption. On Oct. 17, 2012, Bill Clinton gave a $200,000 pay-to-play junket speech to JPMorgan—just after JPMorgan made a fortune in Facebook's May 18, 2012 initial public offering. The collusion among America's senior federal judiciary with Wall Street and Silicon Valley is further evidenced in another patent case in addition to Leader v. Facebook. Dr. Lakshmi Arunachalam, Internet pioneer and former director of network architecture at Sun Microsystems, yesterday filed a motion at the U.S. Supreme Court in her patent dispute with JPMorgan who is infringing her web transactions patent. JPMorgan is muscling the judges to throw out the case on wholly unsupported grounds. Dr. Arunachalam outlines massive JPMorgan conflicts of interest among the presiding judges—they all have substantial JPMorgan financial holdings. With the exception of Delaware district court judge Sue L. Robinson who recused, the judges have obstinately refused to recuse themselves despite Judge Richard G. Andrews' admission that he has JPMorgan holdings. JPMorgan's attorney is Skadden Arps LLP. Hillary Clinton's former chief of staff, Christina M. Chen, worked for Skadden Arps LLP, as did Judge Leonard P. Stark, the very evidently corrupt Obama appointee, last-minute-entry-to-protect-Facebook-for-Hillary's-new-E-diplomacy-plan-and-the-IPO, and presiding judge in the Leader v. Facebook case. A senior security insider who trains law enforcement in digital forensics reported to AFI investigators that Hillary's "smoking gun" treachery has likely been found, but that it is up to Attorney General Loretta E. Lynch to indict. This person believes Lynch will stonewall since the data fingers too many Washington insiders. The source complained about White House interference in the investigation, and said "The Chinese would be the ones that really know what went on with Hillary's server, along with the Israelis." Leader Technologies has indicated they are willing to pay a 10% reward for information that leads to the recovery of funds by their shareholders. The Takings Clause of the Fifth Amendment empowers Congress to legislate a payday for Leader Technologies shareholders. This would provide adequate financing for Leader to offer a rational social networking environment—one that offers the application utility that people have come to enjoy about Leader’s invention without sacrificing security and privacy. 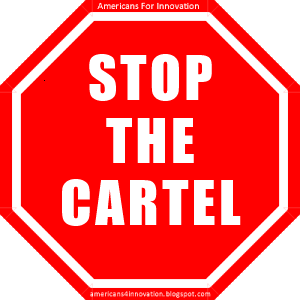 Contact your elected representatives and ask them to use Congress' power of the purse to pay Leader Technologies and unplug the Cartel. Fig. 6—Obama's Fundamental Transformation of America. His wheel of corruption. Click here for hijack of the cyber world timeline and database. Fig. 7—The evidence is unmistakable. 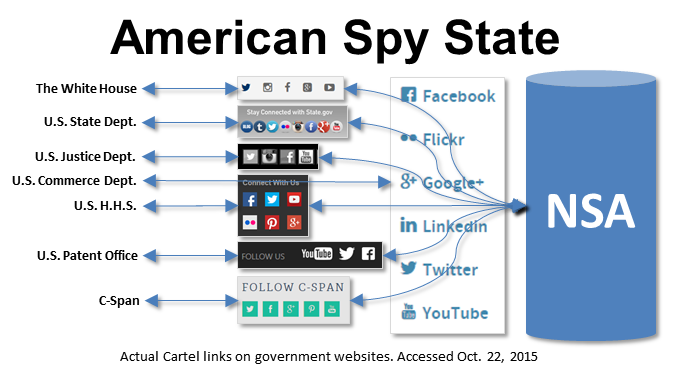 A Cartel of private companies, in collusion with the NSA, collect ALL relationship data between American citizens and the federal government. Much of that data is stored overseas, e.g., Lulea, Sweden, outside the jurisdiction of the U.S. Constitution ("Inside the Arctic Circle, Where Your Data Lives," Business Week). Fig. 8—Primary Participants in the American NSA - C.I.A. Spy State "Public-Private" Cartel. See AFI. (Oct. 19, 2015). The social networking patent property case every American needs to fight. Americans For Innovation. Herridge, C., Browne, P. (Jan. 29, 2016). Official: Some Clinton emails "too damaging" to release. FoxNews. "I did it for the worst of all possible reasons. Because I could." Our country has a serious problem! Here we go. America......let the games begin . Iowa, start your engines. Our job over the next few months , beginning in Iowa, is to determine which person in the Presidential race is best equipped to lead us back from the edge of the abyss. The other option , of course, is to be total lemmings and jump over the cliff into history's dust bin. So here's my scorecard, and , believe me, I am a biased old man. My bias is to be unbiased. GM, Xerox, Oracle, Facebook, Lockheed Martin, Yahoo, Campbell Soup, PepsiCo, IBM, HP, Key Corp, and hundreds of others. It is a fact that the ladies have lost ground in every category under Obama and Hillary's watch. Women have a better chance to blossom in free markets ! And isn't it a coincident that Hillary is a woman who was elected to Congress , held a big position in Obama's terrible cabinet , and is running for America's top job as a woman. Sounds like she wasn't held back.......especially if we take into account her history of incompetence , dishonesty, and criminality . She is running her campaign on female body parts, which incidentally is the same platform that her husband embodied and adored. Sadly, she has a few other platform positions as well. They are all centered on being Obama' third term. I hope that the next four years she is in Federal court trying to lie her way out of Benghazi actions, and exposing America's most precious secrets. America and the world simply deserve better. So what about Sanders? C'mon, he's a friggin' socialist. If he is what the Democrats want then basically half of our nation wants to totally annihilate America's grand experiment. He's cute and precious but not a lover of our freedom and liberties. If he's elected, TEX will lead a new secession effort until my last breathe. Seriously......out of here. Don't worry all of you socialist progressives, I will still harass you. What about the hopelessly inept GOP? What a bunch of non thinking bobbing heads. The entire bunch combined has offered exactly what the Dems have offered. Nada, nothing, nil. At least Trump has shown the courage of conviction. He is disgusting and crass which is refreshing and inspiring. PC could be on the chopping block. Trying to get rich in office would be on hold during his presidency. If an enemy tried to bluff and bluster, Trump would call them a bad name and make them cry. How much fun would that be? At least in our last few years as a free Republic , we could watch a pretty good side show. I hope he goes "bald"in office. Then he could shave his chest like Putin. Imagine hairless world leaders. So where do I come down in Iowa? Caucus your little hearts out. Pick your winners. You are in the heart of " America" for a reason. Represent us well. Herridge, C., Browne, P. (Feb. 01, 2016). Official: Withheld Clinton emails contain 'operational' intel, put lives at risk. FoxNews. Highly classified Hillary Clinton emails that the intelligence community and State Department recently deemed too damaging to national security to release contain “operational intelligence” – and their presence on the email system jeopardized 'sources, methods and lives,' a U.S. government official who has reviewed the documents told Fox News. Schindler, J. (Feb. 2, 2016). U.S. Officials: Hillary's Emails Contain Names of Undercover CIA Spies. The Observer. U.S. intelligence officials say "top-secret" emails Hillary Clinton kept on her private email server when she headed the State Department include the real names of CIA spies serving undercover overseas — a violation of federal law that has put the agents in harm's way, The Observer reports. And, The Observer's John Schindler writes, those emails also include the names of foreigners on the CIA payroll, possibly endangering their lives. "At a minimum, valuable covers have been blown, careers have been ruined, and lives have been put at serious risk. Our spies' greatest concern now is what's still in Hillary's emails that investigators have yet to find," Schindler, a former National Security Agency analyst, says in his report. Klein, E. (Feb. 02, 2016). Ed Klein: Hillary's Feeling the Bern - From FBI Director James Comey. Newsmax. Hillary Clinton is Feeling the Bern — but the real heat isn't coming from Bernie Sanders, who fought her to a humiliating dead heat in the Iowa caucuses. The Bern is coming from James Comey, the straight-arrow director of the FBI, who is leading the investigation into her email scandal. Prosecutors at the Justice Department and managers in Hillary's presidential campaign tell ED KLEIN CONFIDENTIAL that the FBI has zeroed in on three people in Hillary's inner circle. GREENSPAN said he saw no risk in allowing Keating to invest customers money Keating reportedly paid Greenspan $40,000. Greenspan praised Keating’s sound business plans and expertise, Keating went to prison shortly afterward,.and then Raegan appointed Greenspan chairman of America’s central bank,Greenspan was reappointed by president Clinton and Bush. During the Clinton administration deregulation continued under Greenspan and the Clintons made millions in this market help on by Robert Rubin former CEO of investment bank Goldman Sacks and Larry Summers a Harvard economics, having lobbies and lots of money and step by step captured the political system Facebook was established with Bill's and Goldman Sachs' money, then Barack Obama announced his candidacy on the platform the developments of Facebook were a direct function of Bill Clinton's collaboration with Goldman Sachs. But it was time for the Clinton’s make more MONEY?. involving Bill Clinton, Goldman Sachs, Frank Giustra, James W. Breyer, Mark E. Zuckerberg and the stolen idea Facebook. Hillary Clinton talk about this stolen idea facebook on her private Email that she set up but didn't wont Obama to know about but Obama was sell OUT? Obama is a truly fascinating American president. Yesterday he spoke at a mosque in Baltimore and lectured US citizens for being mean to Muslims. He didn't say anything about the hundreds of deadly attacks by Muslims on Americans and American interests since the late 1970's . He speaks of their important contributions to American society while they obviously fail to integrate into our society when they get the chance. He claims to fight for equality of all women in America while Muslim men treat women as second class citizens. In their societies around the world, women can't drive, they can not hold public office, little girls don't go to school, and women can't show off their new hairdos. Obama is not an ignorant or misinformed man.......he is either totally delusional, or a man with a non Christian, non atheist, non Jewish agenda. Whether he claims to be a Muslim or not, he is totally fascinated in their theocratic way of societal control. The mosque in which he spoke is actually on a terror watchlist......yet not once did he suggest that the local Imam should stop his radicalizing preaching. Why? Often when Obama speaks, he has all Christian wall artifacts removed or covered. Yesterday he stood in front of a very large Islamic symbol as he spoke. So we have Obama , on one hand, soft selling Islam in America, and we have Hillary and Bernie, on the other hand, peddling socialism as a solution to our current economic malaise. Folks, we are facing a seminal American election. The way this is setting up, we could have anarchy, riots, and burning cities regardless of the outcome. The reasons for this , deep to the core, divisiveness is the man speaking in the mosque yesterday. He has thrown all of us, black, brown, white, under the bus. He truly believes that if America changes it's "US Constitution way of life" , the Muslim terrorists will go back to their fabulous efforts in science, math, the arts, and so on. The truth is that " modernity" is their enemy. Advancement is their opponent. Death to all infidels is their goal. So my first question is can Bernie or Hillary combined ( that's a frightening thought) have enough moxie to overcome the stage that has been set? This country has a massive pile of debt, a faltering economy, porous borders, and a broken political system. My second question is , when will these idiot Republicans stop their third grade antics and talk to us about solutions, plans, ideas, and leadership? Are we toast? I truly pray that a leader will emerge. Wire Report. (Feb. 04, 2016). 'Something smells:' Des Moines Register calls for audit of Iowa Dem caucus. FoxNews. Hillary and Bill's cozy relationships with Goldman Sachs and the big banks is being outted by Bernie Sanders, I love it. Bernie: "The economy is rigged"
Remember The Artful Dodger in the musical Oliver? ACCORDING TO HILLARY, THESE FEES DON'T AFFECT THE CLINTON'S POLITICS. This does not include the billions of dollars flowing into The Clinton Foundation. Staff. (Feb. 05, 2016). McCain: Clinton's admission of [$650,000 Goldman Sachs] speaking fees a 'seminal' moment in politics. The Hill. Sen. John McCain (R-Ariz.) tells The Hill that Hillary Clinton's admission of receiving $650,000 in speaking fees from Goldman Sachs was "one of the most seminal moments" he's seen in American politics. [Editor: Politicians are required by the ethics rules to disclose the income of their spouses. Hillary does not get a pass from Wall Street connections because they are Bill's and not hers. She should be disclosing them both, and they do in their financial disclosures, which is where amounts cited above come from. Critics are blasting Hillary Clinton for claiming at Thursday night’s Democratic debate that nothing will come of the FBI probe into her email practices and seizing on reports that other former officials received classified information on personal accounts -- saying she’s glossing over glaring differences between her case and theirs. WASHINGTON — The State Department has discovered a dozen emails containing classified information that were sent to the personal email accounts of Colin L. Powell and close aides of Condoleezza Rice We completely failed to prevent scammers and fraudsters from collapsing the world economy, destroying the hopes and futures of billions of people, wrecking the American middle class and doing it over and over again.WITH HILARY CLINTON?? Hayward, J. (Feb. 05, 2016). Facebook censorship and the war on free speech. Breitbart. Free speech is under assault — not only in repressive dictatorships suddenly able to influence global conversations through the Internet, but across the Western world, and even in the American bastion of free expression. Absolute protection for speech as an inalienable right has given way to bitter squabbling over how much free expression should be sacrificed for various, ostensibly noble goals, and who the censors will be. We are all totalitarians now. Anyone bothered by that reality had better speak up, loudly enough to be heard by billionaire CEOs, while they still can. Ok, America, let's talk money. Our country just hit a real milestone......$19 trillion in debt. No country has ever achieved this impressive milestone before. Do any of our presidential candidates address this monster in their game plan for America? I guess the number is either non fixable or not important. A trillion is a BIG number. Let me give you a simple comparable to explain how big this $19 trillion debt number really is. Let's say that 2,000 years ago , Jesus sat down on a rock and committed to put $26,000,000 per day in a cookie jar. He never missed a day without putting in $26,000,000 . The total of dollars that would be in his clay jar today would be close to $19,000,000,000,000. Now if he continued to deposit in his jar until we had enough to pay off our current committed, but UNFUNDED, US obligations ($140 trillion) , he would be there until the year 15,000 AD putting in $ 26,000,000 per day. So Bernie and Hillary are trying to get elected by adding to our current debt obligations by giving away free everything. Each day they strive to give away more than the other. When Barack Hussein Obama came into office in 2008, our debt was around $10 trillion. Today it's $19 trillion. Can we take anymore of this ? Imagine this.......our "TOTAL" US economy is around $17.6 trillion. That's every transaction every day for a year. Seriously, would somebody in the press please ask the Democrats if they know how we can possibly outrun their incompetence ? With only one third of of our capable citizens paying taxes, how can we ever pay this back? When will our government find that the productive folks will not produce any more? When does the rest of the world begin to push back on the fiat dollar? Remember, the only underlying asset of the dollar is "the faith and credit of the US government". It's not looking so good. Fitzgerald, S. (Feb. 06, 2016). DHS Official: I Was Ordered to Purge Records of Islamic Terror Ties. A veteran official with the Department of Homeland Security claims he and other staff were ordered to destroy records on a federal database that showed links between possible jihadists and Islamic terrorist groups. "After leaving my 15-year career at DHS, I can no longer be silent about the dangerous state of America’s counter-terror strategy, our leaders’ willingness to compromise the security of citizens for the ideological rigidity of political correctness—and, consequently, our vulnerability to devastating, mass-casualty attack," the former employee, Patrick Haney, wrote in an explosive column that was published late Friday on The Hill website. Haney, P. (Feb. 05, 2016). DHS ordered me to scrub records of Muslins with terror ties. The Hill. Amid the chaos of the 2009 holiday travel season, jihadists planned to slaughter 290 innocent travelers on a Christmas Day flight from the Netherlands to Detroit, Michigan. Twenty-three-year old Nigerian Muslim Umar Farouk Abdulmutallab intended to detonate Northwest Airlines Flight 253, but the explosives in his underwear malfunctioned and brave passengers subdued him until he could be arrested. The graphic and traumatic defeat they planned for the United States failed, that time. Most Americans were unaware of the enormous damage to morale at the Department of Homeland Security, where I worked, his condemnation caused. His words infuriated many of us because we knew his administration had been engaged in a bureaucratic effort to destroy the raw material—the actual intelligence we had collected for years, and erase those dots. The dots constitute the intelligence needed to keep Americans safe, and the Obama administration was ordering they be wiped away. This blog has been right on about Goldman Sachs and Billary's central role in the Cartel, the theft of Leader Technologies' social networking invention and the NSA spying on Americans. No wonder Billary has no good answer. Anything she says digs her political grave. I totally love it!!!! Right on AFI!!!! Stop a random person on the street, ask them to describe Hillary Clinton's biggest problem as a candidate, and a list that is almost certain to include the following will emerge. Here are the links to the comment above spelling out Bill's and Hillary's speaking fees from Wall Street between 2001-2014 from their own financial disclosures as well as to our previous investigation of the Clinton's financial disclosures. ALL FACTS VERIFIED UNDER OATH BY THE CLINTONS THEMSELVES. PayPal wants to replace our "old" Benjamins with their "new" manipulated digital transactions. SquareSpace wants to make all our websites "beautiful." Bottom line, SquareSpace and PayPal are both Goldman Sachs cronies and in bed with Facebook and the IBM NSA Eclipse Foundation Cartel that stole social networking from Leader Technologies. WARN YOUR FRIENDS. These guys are luring you into "The Cloud" only to hijack your money, your property and your identity, and that of your children, friends and social networks. Federal officials are investigating an apparent breach of FBI and Department of Homeland Security employee information off a U.S. government system. I have read and underlined the timeline and am speechless as to how corrupt our government is. 1. The names of each SAP are themselves classified Top Secret because the information within the SAP are far and above Top Secret. 2. SAP’s are so sensitive that even people who have security clearances giving them access to Top Secret Sensitive Compartment Information (TS SCI), an enormously high security clearance level, cannot have accesses to a SAP’s unless they receive a special indoctrination into the SAP based on an operational “must know” that exceeds all other “need to know” standards. 3. Being “read on” for a SAP is far more then acknowledging in writing that you have been briefed on the SAP. It is an in-depth “indoctrination” into the given SAP, and each SAP is itself compartmented separately from other SAPS. Having access to one SAP does not give you access to another SAP, and in fact rarely does. Only a tiny handful of people have knowledge of all SAP’s. SAP’s are the most stringently compartmented and protected information in the entire US government. 4. Unlike Top Secret SCI which is maintained in highly secure Sensitive Compartmented Information Facilitates (SCIF’s) managed by specially trained Special Security Officers (SSO’s) at various levels of command, every single SAP is managed by an individually designated Program Manager for each individual SAP covering an entire theater of operations. In other words, SAP Program Managers are far fewer in number than there is SSO’s. SSO’s are not cleared to even know about SAP’s or to maintain information about them in their already enormously secure SCIF’s. How SAP’s are secured cannot be discussed because of the sensitive beyond Top Secret nature in which it is done. 5. Unlike individuals with the highest Top Secret SCI access security clearances, who must undergo a special background information with periodic “bring-up” background investigation, those tiny few who have access to SAP’s must also endure periodic polygraph tests in addition to the most comprehensive of special background investigations. I used to have to schedule four-star generals and admirals to be polygraphed in order for them to maintain their access to my SAP. Many generals and admirals who obviously have the highest security clearances still did not rate being indoctrinated into my SAP. In fact, they didn’t even know the SAP existed. 6. Compromise of a SAP is the single most dangerous security violation that can ever happen to the USA. Even the enormously damaging revelations of the Edward Snowden’s TOP Secret SCI security compromise does not reach the level of a SAP compromise. 7. To put SAP information in to an unsecure sever like Hillary Clinton’s unsecure server is a class one felony that could, in some cases, result in life in prison. That is because such a compromise is so dangerous that it could and likely will result in the death of people protected by and within the scope of the SAP. As a former SAP Program Manager I believe it is inconceivable that if it is verified that Hillary Clinton’s server actually had SAP information on it that she could possibly escape indictment and criminal prosecution. As hard as it is to imagine, that would even be worse then electing to not prosecute a mass murdering serial killer because even they could not inflict as much damage on our country as the compromise of a SAP. Compromise of a SAP not only could -- but without doubt would -- cause serious damage to our national security. If it is true that Hillary Clinton had SAP information on her unsecure server, whether it was marked or not, you can be sure that the FBI will strongly recommend that charges be brought against Hillary Clinton and continue in an exhaustive investigation to trace back to every single person that had even the tiniest role in this unbelievable security compromise. If the Attorney General, through “prosecutorial discretion,” elected not to prosecute this crime, I believe congress would have no alternative but to impeach her, and the FBI would then have no choice but to conduct a criminal investigation of her for a deliberate cover up –- so grave is this security violation. If President Obama were to pardon Hillary Clinton for a compromise of this magnitude he would render himself in the historical record as an “enemy of the state,” and could himself face criminal prosecution –- so grave is such a security compromise. Nobody, not even the POTUS could gets away with something like this in our system of government. If anyone could escape persecution for compromising a SAP, we are deep trouble as a nation. No president who loves this country and is ttrue to his oath would ever allow anyone, not even his or her closest and most loved relative, to get away with a SAP compromise. It is simply unimaginable that this could ever happen. If the ongoing investigation finds that Hillary Clinton compromised a SAP, then we all should know with certainty, regardless of political persuasion, that she is entirely unfit to hold public office of any kind let alone President of the USA -- and ALL Americans should never tolerate it. Compromising a SAP is an absolute “disqualifier” for public office and access to our nations most sensitive information - period. P.S. It is my sincere hope that each of you will share this article, to help other Americans understand how grave Hillary Clinton’s alleged SAP compromise is. We can’t allow anyone so careless with this level of information to have access to any classified information ever again for as long as she lives. This would surely render her unqualified and unfit to hold any public office let alone POTUS if this allegation proves to be true. Petition from the left-leaning CREDO. While the wording of the pitch blames Republicans and not Democrats who BOTH have their hands in the Wall Street cookie jar, all Americans have an interest in putting Wall Street's post deregulation greed and fraud back in the bottle that Bill Clinton and Larry Summers (Democrats) unleashed on the world when they abolished Glass-Steagall banking regulations in 1999. At least a dozen email accounts handled the “top secret” intelligence that was found on Hillary Clinton’s server and recently deemed too damaging for national security to release, a U.S. government official close to the review told Fox News. When you boot up Windows 10 for the very first time, you have the option to customize several settings related to the collection of data from Microsoft's servers. Thank you Brits for doing the hard journalism work that the mainstream media is being paid by Wall Street to ignore. THIS IS EXPLOSIVE PROOF THAT EVERYTHING UNCOVERED BY AFI IS FRIGHTENING REAL AND SHAKES THE AMERICAN REPUBLIC TO ITS CORE. IF I WAN'T ANGRY BEFORE, I SURE AM NOW. Bates, D. (Feb. 10, 2016). EXCLUSIVE: How the Clintons embraced Wall Street and made $76,000 a DAY by cashing in with speech after speech - but now Hillary wants to fight to 'rein in' the money men. The Daily Mail (UK). DOWNLOAD THESE FILES TO YOUR OWN COMPUTER. OTHERWISE, THIS DATA HAS MAGICAL WAYS OF DISAPPEARING IN THE FOG OF SPY STATE CARTEL CENSORSHIP.